On January 30, I joined 300 Muslims and Christians who gathered at the Gatineau mosque. At the invitation of Archbishop Paul-André Durocher Catholics and Muslims started talking to each other -- embracing, shaking hands and some even hugging -- to find human beings that needed one another in this time of crisis. Although it wasn't covered widely in Canadian media, in recent months, a Canadian tourist, along with 13 Jordanians, was killed by terrorists in Karak, Jordan. According to reports, the terrorists' real plan was to attack the local Catholic Church on Christmas Day. 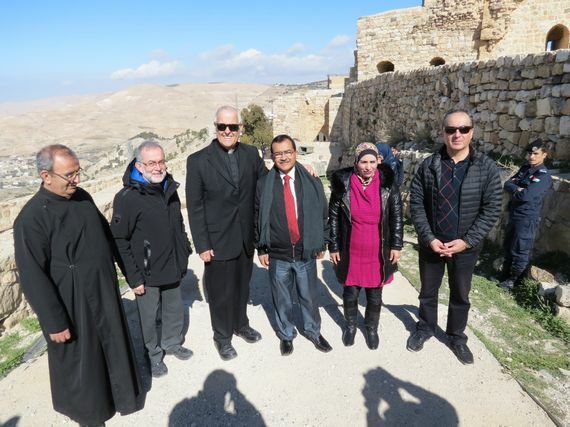 CNEWA leadership met with local Muslims at a medieval castle in Karak, Jordan, and prayed together at the site where a Canadian was killed in December in an attack by Daesh. From left to right, local Catholic priest Fr. Boulos Baqa'een, Canadian Bishop Lionel Gendron, Msgr. John E. Kozar, President of CNEWA, two Muslim locals and CNEWA Jordanian Director Ra'ed Bahou. On January 30, I joined 300 Muslims and Christians who gathered at the Gatineau mosque. At the invitation of Archbishop Paul-André Durocher Catholics and Muslims started talking to each other -- embracing, shaking hands and some even hugging -- to find human beings that needed one another in this time of crisis. Once again, people asked why. The reasons are multiple and complex, but at the root of it all, our world has changed in the last 30 years and we face many unresolved issues. For example, multinational corporations and financial markets have too much influence over states, while organized crime can destabilize key sectors of country's economy and institutions. Disproportionate wealth accumulation is in the hands of a few and its lack of distribution is also a problem; our petroleum-based economy is in conflict with new environmental initiatives and the many violent armed conflicts in the Middle East are making things worse. Pope Francis has called this the beginning of a world war fought "in pieces" around the world -- fuelled by terrorism, unforeseen acts of violence, organized crime, abuses suffered by migrants and devastation of the environment. The world needs to wake up its leadership to this pressing need. Politicians and international diplomacy have failed miserably to respond to the new reality the world faces. Too often, politicians are pushing self-serving and negative ideologies to get more votes. The damage they are doing is deep. Isn't it obvious that if we spent as much money, resources, time and energy on building peace as the world currently does on weapons and war, the world would be a better place? If our politicians have a hard time adjusting, it is then up to us as citizens of the world to put pressure on them so that they too realize that peace is the only solution. To achieve this, voices of tolerance, understanding, dialogue and peace must ring out loud and clear. Let's join Pope Francis call who said forcefully on January 1 that the world must reach out to "migrants, those in need, the sick, the excluded and marginalized, the imprisoned and the unemployed, as well as victims of armed conflict, natural disasters and all form of slavery and torture. Every such response, however modest, helps to build a world free of violence, the first step for justice and peace."